Two weeks after his eighteenth birthday, everything changes for Evan Nash. When he injures his head after being run down on his bicycle, he begins having strange, harrowing visions whenever he tries to sleep. He turns to psychiatrist Shannon Mayer for help. Mayer has troubles of her own: her daughter has been kidnapped, and she’s desperate for answers. Though she’s at first skeptical of Evan’s accounts, it quickly becomes clear that his mysterious ailment may be the key to finding her child. Soon Evan’s visions prove essential to the case but at a terrible cost. Evan and Shannon face an agonizing decision: Should he risk himself to save the girl? 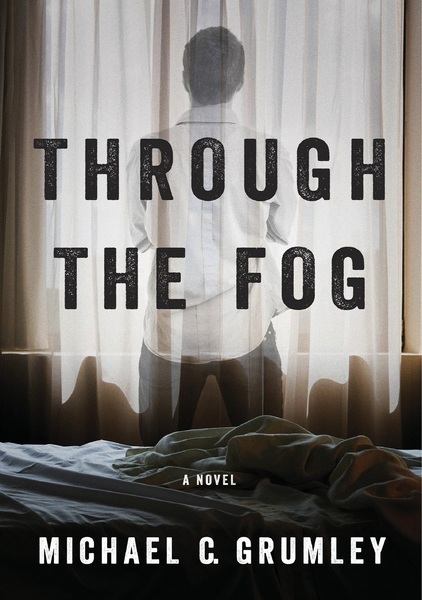 Revised edition: Previously published as Evan After, this edition of Through the Fog includes editorial revisions. A Fascinating Read! Michael Grumley has done it again! Evan After will make you want more! He lurched upright in the darkness, his chest heaving uncontrollably. Traces of light crept in from around the window, and a much brighter glow from under the door illuminated part of his floor. The door opened a moment later, blinding him in the glare. From his bed, he looked up at the silhouette in the doorway. His breathing was still labored. “I’m okay.” He didn’t want to worry her any more than she already was. His mother crossed the tiny room and sat on the edge of his bed. She was still in her work uniform. “Are you sure? I heard you yell.” She ran a gentle hand over his brow. His forehead was dripping with sweat. “I think it’s getting worse,” Evan replied hoarsely. He nodded, clearing his throat. “Do you want to tell me about them?” she asked calmly. He was pretty sure that was her way of asking if he was lying. He wasn’t really, at least not technically. He wasn’t lying as much as just keeping something to himself. But if it meant not taking pills, then he’d have to tell her. It was just embarrassing, especially since he’d just turned eighteen. It was only his third session, but something had struck him from the first time he met Dr. Mayer; nothing seemed to surprise her. She always looked at him with the same calm expression. He hoped that meant her other patients were even weirder than he was. Mayer managed to keep her eyes from rolling. “Were you hurt? !” God, why didn’t he tell me? Was he embarrassed? “Not really. Just a lot of scrapes. My helmet was busted though.” He decided to leave out limping home in the rain, carrying the bike. Mayer sighed and leaned back into her own chair. Evan was certainly getting more than his share of being picked on, which, unfortunately, due to his demeanor and size at his age, was not entirely surprising. Was it possible this was related to something else? Yes. Was it likely? Not in her opinion. But the fact was, he was officially an adult now. She couldn’t actually make him do anything. Mayer knew they didn’t have much money. He told her it was just his mother and himself, and she worked two jobs to keep him in a decent neighborhood and a good school. And judging from the healthcare plan he was on, she suspected their situation was worse than he let on. “Okay.” He was not about to ask questions. He was happy to get out of there while he could, before Dr. Mayer asked the question he feared answering. What was it that caused his bicycle accident? The San Ysidro Port of Entry was the busiest land border crossing in the world, where over 300,000 people commuted between California and Tijuana, Mexico every day. Yet even though it housed the largest border facility in the Americas and employed the highest number of agents, the wait to cross into the United States from Mexico could take as long as five hours on a bad day. And today was one of those days. Hundreds of cars sat idly in the hot afternoon sun, waiting for the line to advance, many with their windows up and air conditioners on. Near the front of the line, over two dozen lanes stretched the length of the three story structure where border patrol agents asked drivers questions and looked over their cars. Silently, a fifty-year-old man studied two agents from behind the steering wheel of his old silver Honda Accord. He watched carefully as the agents questioned the driver of the car in front of him. It was taking longer than usual. He wondered if they were looking for something, or someone, specific. He gripped the wheel tighter, waiting. Finally, the car pulled away and as the man was motioned forward, one of the agents mumbled something to his partner. The man inched forward and tried to breathe calmly. “Afternoon,” the agent said, leaning in. The man put the sedan in park and handed the agent his driver’s license. The second agent on the other side of the car peered through the front side window, then walked back and looked into the back seat. “What was the reason for visiting Mexico?” the first agent asked. “To visit my sister. She’s sick,” he lied. The driver shook his bald head. “No.” He was desperately trying to appear as calm as possible. There wasn’t anything in the car; they could search it all day long. As long as they didn’t search him. “Did you bring anything in, Mr. Roa?” asked the agent, glancing back to his ID. “Nope,” he lied again. Was his expression still calm? Was he overcompensating? A beep sounded and the agent looked at the small device in his hand. The sedan’s license plate flashed on the screen which displayed the date and time the car had last crossed through from the U.S., a little over five hours ago. The agent straightened and exchanged looks with his partner over the top of the vehicle. His partner gave a silent nod of his head. Roa nodded and pulled forward, slowly accelerating and joining the narrowing stream of inbound U.S. traffic. He looked in the rearview mirror and watched the agents turn their attention to the next car. He thought about how lucky he was that the hot weather made the beads of sweat on his forehead appear normal. Finally, he patted his breast pocket to make sure it was still there. He was lucky indeed. Roa looked at his watch and mentally calculated the time back to Santa Clarita. This was the longest he’d been away in over 18 months, and he was getting very nervous. As it turned out, what Dr. Mayer didn’t want Evan to do was sleep. She told him to do whatever he had to do to stay awake. Fortunately he had an old video game at home, and since they were out for spring break, there was no school to get up for. Needless to say, he was exhausted. “Are you tired?” she asked with a hint of amusement. She knew what he had been doing all night. “Okay.” Evan wriggled his body and tried to settle into the soft couch. He was really tired. It only took a few minutes to feel his eyelids getting heavy. His disjointed thoughts, the sure sign of nodding off, were the last thing he remembered. Evan suddenly bolted upright in a cold sweat, a panicked look on his face. “Easy! Easy!” Mayer said from her chair next to him. It took Evan a full minute to calm his breathing and answer. “Yes.” He could still see it, and it was as clear as a bell. These didn’t fade as quickly as dreams did. Unfortunately, they stayed for a long time. Mayer sat in her chair, silently staring out the window. She was struggling to concentrate, even on Evan, whose problem was clearly getting worse. She forced herself to focus. Even she had to admit, his “over there” statement struck her as a little odd. But the more she thought about it, the more sense it made. It was not uncommon for patients to imagine things from a distance or a different angle. In fact, it happened quite often. Frankly, imagining the two of them sitting across the room was rather benign, even when he added that he saw the reception area where Mayer’s receptionist was eating lunch. He had just walked through there. Not to mention the boy was eighteen, and Shannon Mayer’s receptionist was exceptionally attractive. No mystery there. But clinically speaking, misperceiving stimuli was one thing, and it was called an illusion. Seeing something that wasn’t there at all was something else; a hallucination, and that was far more concerning. That Evan seemed to be experiencing the former, and not the latter, gave her at least some sense of relief. Hallucinations were often symptoms of very real problems. Drugs and alcohol use were well known causes, but hallucinations could also be the result of genuine mental or physical illness. She was convinced Evan didn’t drink or take drugs, which left the alternative diagnosis a much more worrying one, especially with a head injury involved. What really worried her though was how quickly Evan’s heart rate had increased and, even more, how quickly he began sweating. Both were unusual, not to mention the shaking, and while it wasn’t enough to sound like epilepsy, Mayer reluctantly acknowledged it was still a possible tie to hallucinations. A few minutes later, Evan returned from the restroom, closing the door quietly behind him. He walked tentatively across the room, not sure if he should sit back down. “Okay.” There was obvious relief in his voice. Evan took a deep breath. “And I don’t want you to worry about money, let me work on that.” With that she motioned toward the door, and walked with him. “I understand.” This was not the time to get into that, she thought. She opened the door, and they walked back down the short hallway into the large, open reception area. Mayer kept her grin hidden as she watched Evan’s expression change upon seeing her receptionist Tania. She could have been a model, and most of her male patients had a very similar reaction. Tania dialed the number and spoke briefly to someone on the other end, while Evan tried hard not to stare at her. “Yes.” Evan took the card from Tania and examined it. “Do you have a way to get there?” Mayer interjected. Tania laughed and flashed her perfect smile. Evan thanked them and crossed the room to the door, where he opened it and stepped out. Mayer took a deep breath, still thinking about the young man. But it was when she turned to walk back to her office that she suddenly froze when she saw what was sitting on Tania’s desk. "Can't wait to read the next one!" Thank you for reading Through the Fog. This FAQ page is a small supplemental to the book, and answers common questions by readers. Please note that this page contains SPOILERS to the book, so if you have not read THROUGH THE FOG, please do so before continuing. Q: When is the next Evan After book expected to be out? A: I’m currently working on LEAP, the sequel to Breakthrough. I’m hoping to have it done by July 1st. After that I will immediately begin work on EVAN AFTER: TWO. Q: Evan obviously survives. Does he team up with Dennis Mayer for the subsequent books? A: Yes, Evan does team up with Dennis in the short term, but you won’t believe where things are ultimately headed. And his dire health problems are far from over. Q: Will there be more on Dan Taylor’s character? A: Yes, very much so. Dan Taylor may have been hiding…but he certainly wasn’t idle. Q: Was the “Stargate Project” real?